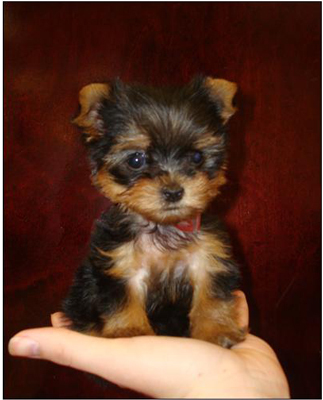 Some breeders have begun producing “Teacup” Yorkies that weigh 2 to 3 pounds. Compared to true Yorkshire Terriers, which weigh in at about 7 pounds, Teacup Yorkies are truly tiny. Before considering purchasing one, you need to be aware of some characteristics of Teacup Yorkies. Teacup Yorkies aren’t true Yorkshire Terriers. They can also require specialized medical care. Now there’s nothing wrong with having a smaller Yorkie, as long as the breeder was using ethical breeding practices. Periodically, and for no apparent reason at all, some dogs are born very small; and they steal your heart because they’re so in need of love and care. Some unscrupulous and unethical breeders, however, deliberately try to produce these little dogs and call them “Teacup” Yorkies, leading unwitting buyers to believe that Teacups are an actual variety of the Yorkshire Terrier breed. They’re not. There’s no such thing as a Teacup Yorkie. A Teacup Yorkie isn’t an officially recognized by the AKC. It is simply too small to be a true Yorkshire Terrier. Anyone who tells you (or implies) otherwise either doesn’t know what she’s talking about or is lying. A Yorkie who weighs 3 pounds or less often requires special care. Extra-small Yorkies are more prone to serious health problems and birth defects (like portosystemic shunt or small kidneys — which you won’t know about until much later). Although extra-small Yorkies are occasionally born, no responsible breeder breeds for this trait. Because the breed standard is for 4 to 7 pound dogs, responsible breeders should only breed dogs that fall within this weight range. Breeding very small dogs is not safe for the mothers. Small size does not make these dogs more valuable. A small Yorkie shouldn’t cost more than a healthy, normal-sized one. In fact, it should cost less because it is not up to the breed standard. They should also only be sold after being neutered or spayed.